Find derivative using Part 1 of the Fundamental Theorem of Calculus? Thread: Find derivative using Part 1 of the Fundamental Theorem of Calculus? I never seen this problem before! I tried expanding and doing all that stuff but I got the wrong answer! 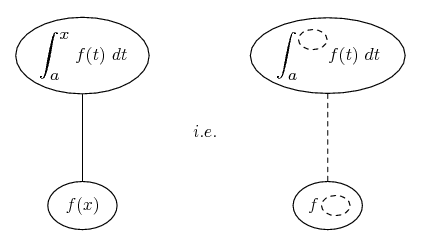 ... differentiating downwards with respect to x (on the left) or with respect to the dashed balloon (right), the latter referring to chain rule, as below. You might like to use properties of definite integrals to split the integral around a constant a. ... is the chain rule. 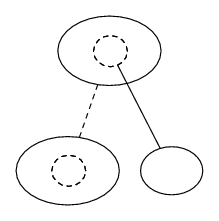 Straight continuous lines differentiate downwards (integrate up) with respect to the main variable (in this case ), and the straight dashed line similarly but with respect to the dashed balloon expression (the inner function of the composite which is subject to the chain rule). So you have half of the derivative you seek, on the bottom row, and you'll want to subtract a similar result got from applying the same process but with sin in the dashed balloon. Last edited by tom@ballooncalculus; Oct 6th 2010 at 11:00 AM.